No more clutter on your laptop/PC desktop! 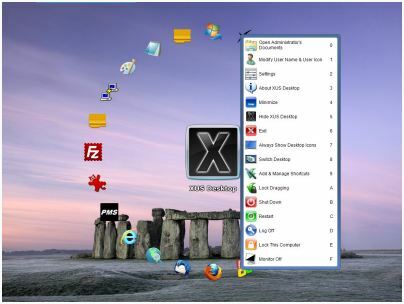 With XUS Desktop you can easily organize all your desktop shortcut icons. Finally your desktop will look beautifully organized like it has never been before. XUS Desktop is extremely easy to use and while it is very thrifty on resources it permits (beside some handy power functions) the quickest access to any location on your system and launching multiple programs is now a breeze.